True West named the What Cheer Saloon as one of the best bars in the West. The only bar in California to make the top 10. From the True West: “the What Cheer Saloon in Columbia California in the Columbia City Hotel. The Ale House served countless miners and others who came to California during the Gold Rush. And that cherry-wood back bar is a piece of art. 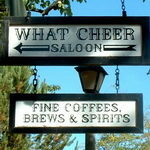 It’s been at the What Cheer since the saloon opened in 1857. They shipped it around the Horn from Boston.” The back bar survived two major fires including the removal of the entire back bar to a safe place during one of the fires. The restaurant is now open for dinner, Wednesday to Sunday at 5PM. And don’t forget to sign up for their annual Victorian Feast that runs in December. More info here.